Digital piano C1 offers levels of playability and versatility that will exceed the expectations of the most demanding pianist. From the very first note, the depth and clarity of sound that the C1 delivers from its compact, slim-line cabinet will astound both player and audience alike. The precisely-engineered keyboard provides a feel and response that has been designed to help the student develop a sound playing technique while responding fully to the demands of the more advanced player. 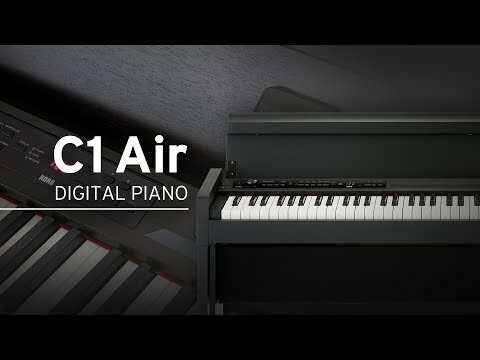 First and foremost, the KORG C1 is a superb piano, both as an exciting alternative to an acoustic instrument or in locations where a traditional instrument could not be used. It never needs tuning and can be used with headphones to avoid disturbing others. Furthermore, a variety of additional features will inspire new levels of creativity in players of all abilities and enhance their enjoyment of music, including 30 superbly realistic instrument sounds, Bluetooth audio streaming and on-board recording. Designed and manufactured in Japan, the KORG C1 redefines the digital piano. Keyboard: 88 key (A0–C8), RH3 (Real Weighted Hammer Action 3) keyboard. Touch curve selection: five types. Maximum polyphony: 120 voices (max). Sounds: 30 sounds (10 x 3 banks). Effects: Brilliance, Reverb and Chorus (3 levels each). Recorder: 2 parts, Maximum 14,000 notes (approx. 100k bytes). Demo songs: 50 (sound demo songs: 10, piano songs: 40). Metronome: tempo, beat, sounds, level. Pedals: damper, soft, sostenuto. Half-pedaling supported. Connections: line out, MIDI (in, out), headphones x 2, pedal, speakers, DC 24 V.
Controls: power, volume, piano song, transpose, function, touch, brilliance, reverb, chorus, bank, sounds x 10, display, + -, metronome, play/pause, stop, rec, part1, part2. Wireless method: Bluetooth (A2DP Sink). Output power: 25 W x 2. Power supply: DC 24 V.
Included Items: AC adapter, power cord, stand with speaker and 3 pedal unit. Dimensions: 1346 x 347 x 770 mm. Do you own Korg C1 Air-WA or have you had a chance to try it?